Astro Chase, by Fernando Herrera, is a lively space-action game with impressive graphics and sound. Written for Atari, it contains several innovative features that distinguish it from others on the market. The object of the game is to defend Earth from aliens of the Megard Empire. 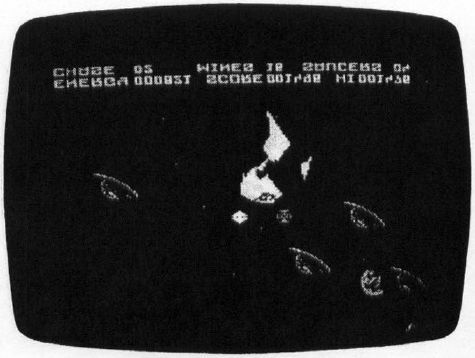 The playfield, which is a two-dimensional (map-style) depiction of the galaxy, is several times larger than the area visible on the screen. As you move your ship — Earth's sole defender — toward the edges of the screen, the background scrolls to reveal other portions of the galaxy. You can't visit the entire galaxy, however. The Megardians have thrown up an invisible force field that keeps you in the vicinity of Earth. That's just as well, for to succeed at Astro Chase, it's best to cruise near Earth, intercepting the robot-like Mega Mines as they move in. If one of the mines reaches the home planet, the result is a spectacular, game-ending explosion. The Mega Mines have only one objective: to reach Earth. They never deviate from their path and cannot attack your ship, but the attack fighters can and will. As you advance to the higher levels, the fighters become more numerous and wield more impressive power. Some of them try to ram your ship; others fire lasers; some can even pass through planets in their relentless search for your craft. If you spend too much time going after the fighters, the Mega Mines will surely get through. One of the most challenging aspects of the game is learning to control your spaceship. You can set your course, then aim and fire your lasers independently — all with the joystick and fire button. The result is a very versatile craft, but one that's difficult for beginners to handle. The secret is that when the fire button is depressed, the joystick controls the direction of the lasers. When the fire button is up, the joystick controls the ship. It sounds simple, but practice is required. In Astro Chase, you defend Earth against aliens of the Megard Empire. If you bump into a planet or the force field, you'll bounce back — perhaps adding to the confusion until you get the hang of maneuvering the ship. Another pitfall is the hot stars. These are bright stars scattered around the galaxy. If you run into one, you'll be stopped until you back up and go around. Running into either the hot stars or the force field drains energy from your ship, as does moving and firing lasers. You can recharge your energy by flying back and forth over one of the four energy generators. There's one at each corner of the square force field. Shield depots are also located around the force field perimeter. When you fly through one, your ship turns from solid white to flashing colors — and you are invulnerable for ten seconds. You can even ram and destroy the attack fighters. But don't neglect your main mission: eliminating the Mega Mines. When you begin Astro Chase, you are in level eight. With the Select button, you can choose any one of 24 levels. Each time Earth is destroyed, you move down one level. But if you destroy all 16 Mega Mines, you move up to the next higher level. And if you go beyond level 24, you reach the master level (24-34); it's definitely for experts only. The graphics in the game opening and the intermissions after each group of seven levels strikingly depict the spaceport on Earth. In the first sequence, you, the pilot, walk out and beam onto the spacecraft, which lifts off in a blaze of rocket fire. The pilot returns to the spaceport in the first intermission, looks around, and asks, "Where is everybody?" Each scene that follows is slightly different. If you move from the lowest levels all the way to the expert grade, the intermissions provide a little story line within the game. The action in Astro Chase can get pretty frantic as you dodge the fighters, bouncing into planets and stars — all the while trying to stop the undeviating Mega Mines. But you can succeed by mastering your ship's movement and developing a prudent strategy for engaging the Mega Mines. If you like space-action games, this is one to look for.